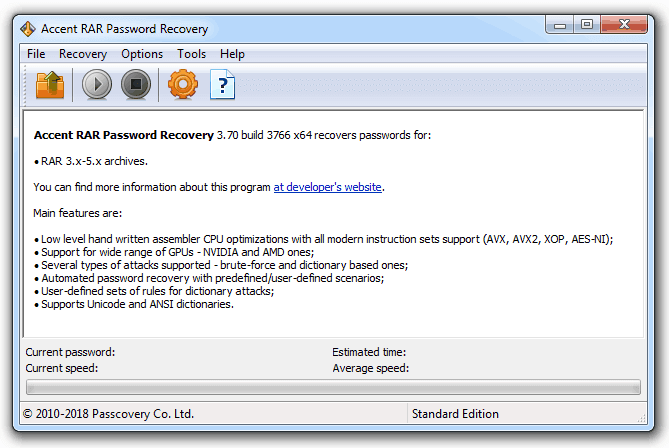 Accent RAR Password Recovery - is the professional solution for recovering lost passwords to RAR and WinRAR archives. The search algorithm is uniquely optimized for all modern AMD and Intel processors, and the software supports GPU computing on AMD and NVIDIA graphics cards. All this power comes with a surprisingly simple interface. With AccentRPR, it’s fast and easy to retrieve passwords like a pro. 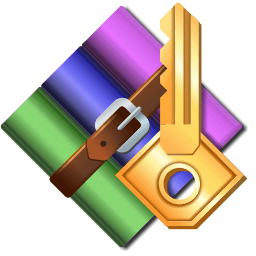 Accent RAR Password Recovery supports RAR3/RAR5 format and can easily recover passwords to archives created in other versions of WinRAR, all the way back to WinRAR 2.90. Program uses AMD and NVIDIA graphics cards to boost search speeds up to 40* times faster on each card. The software uses GPU technology to retrieve passwords for all supported archives. 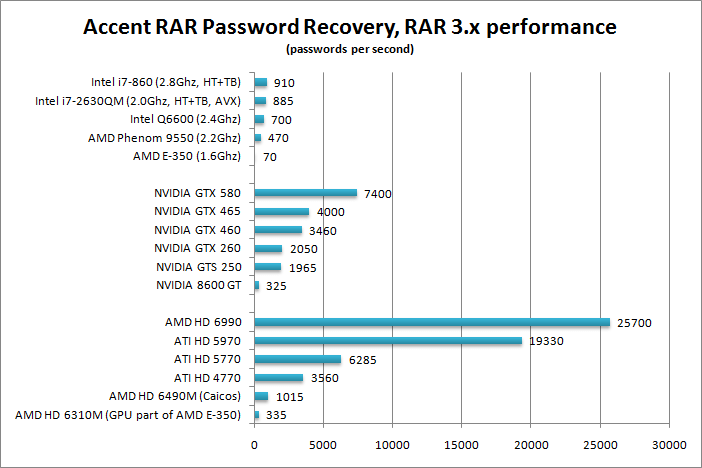 The power of modern graphics cards gives an incredible performance boost, and their flexibility, scalability and affordability make AccentRPR the optimal solution for recovering lost Rar/WinRAR passwords. 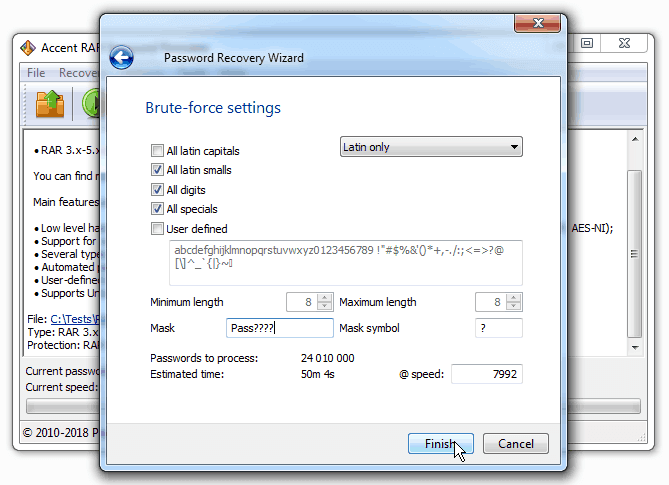 AccentRPR offers three types of attack for recovering passwords: brute force, mask and dictionary attacks. Each type of attack has its pros and cons (learn more). Dictionary attacks are usually the most practical approach, saving time by limiting the search to the most likely passwords. Scenarios are used to describe large collections of common passwords. Software analyses the computer’s configuration and performance to choose the scenario that will cover the most passwords in the least amount of time. This is a great option for occasional users. 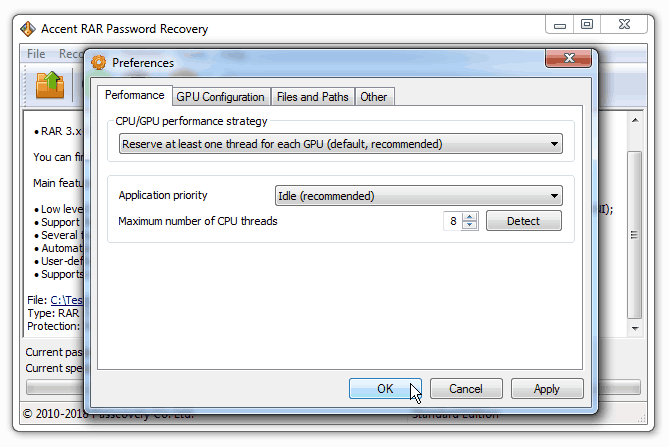 Experienced users can create their own recovery scenarios using a special feature of AccentRPR. Scenarios allow users to define a set of rules that are used by the program to search for the password and flexibly control the arrays of checked values. Accent RAR Password Recovery uses a macrolanguage to describe password mutation rules for dictionary attacks. This makes it easy to tweak passwords, add words and symbols, and combine passwords from multiple dictionaries. This approach cracks passwords like "pa55word" or "VeryStrongPassword1234" much faster than other options. This option will be useful for forensic computing professionals and law enforcement. The program is compatible with AMD(ATI) and NVIDIA video cards supporting NVIDIA CUDA and ATI Stream/OpenCL technology. In other words, AccentRPR can run on all modern AMD and NVIDIA graphics cards. * Comparison was made of one Intel i7-860 processor and one AMD Radeon HD 5970 graphics card. * The measurement data obtained by searching the password length of 4 characters. See what people are saying about Accent RAR Password Recovery and share your own opinion. Our website contain a AccentRPR User's Manual. Please, learn it. NB: Passcovery Suite uses a RAR password recovery module and an interface that are identical to those used in AccentRPR.